This is an article of mine that was published in Grass Roots magazine this time last year. I got too busy to sent articles for a while, but I just started again, so look out for my contributions! Over spring and summer we incubate chicken eggs and raise chicks. We fatten the roosters to eat and keep the hens to replace our older layers. Raising chicks is great fun, a lot of hard work, but worth the effort if you want a sustainable flock. Whether you incubate eggs or buy baby chicks, all chicks need is three things: a safe, warm place to live; water and food. When chicks first hatch, they don’t have any proper feathers (just fine fluff), so they need to be kept warm, around the same temperature as the incubator (38degC) at first and then gradually cooling as they get bigger. We keep our chicks in a large wooden box. You don’t have to use a wooden box, any kind of strong, draught-proof box will do. I have seen plastic, cardboard and metal boxes used as well. We heat the box using a heat lamp and thermostat designed for reptiles. We have both a 60 W and a 25 W ceramic bulb, which we vary depending on the outside temperature (sometimes the larger bulb is too hot, or the smaller bulb not hot enough). The top of the box has a metal mesh frame, to stop the chicks flying out and to stop the dogs helping themselves. You can also use incandescent lightbulbs (if you still have any!) and a thermometer to monitor the temperature in the box. The chicks will tell you if they are too cold, they all huddle under the lamp, and if they are too hot they will be in the opposite corner of the box panting. We also cover the box with blankets at night to keep out draughts. The box usually starts inside the house, because the temperature is more stable, and we move it outside as the chicks start to smell and make too much noise. After they are a week old or so, they are much stronger and able to handle slight temperature fluctuations. We line the bottom of the box with newspaper and then a layer of wood shavings. This is supposed to be easier on their little feet. We had a batch of chickens with crooked feet early on and I think it was from only having newspaper on the floor of their box. They do tend to eat some wood shavings at first, but it must not matter, as long as they find their chick food as well. Inside the box we provide the chicks with a small “waterer”, which you can buy from a produce/stock feed store. This is better than a dish of water because the chicks can’t fall in and get wet (and cold) or drown. They seem to find the water by instinct and there’s no need to add anything to the water, although I've read that people add apple cider vinegar or honey to give the chicks an energy boost, especially if they've arrived via post. There are a few options for feeding the chicks. You can just buy a commercial chick starter crumble, which is formulated for chicks, and usually contains a coccidiostat (an antibiotic to prevent the chicks getting sick from coccidiosis). This is more relevant for large-scale production of chicks and probably unnecessary if you’re only raising a few chicks. A good alternative, if you can find it, is an organic chick crumble which contains all the same protein and minerals as the commercial crumble, without the medication. Now you may want to take things even further and make the chick feed yourself. We have experimented with a few options and found that we can use hammer-milled grain (that we also feed to our adult chickens) supplemented with extra protein and minerals. The extra protein can be in the form of meal worms, compost worms, meat meal mix (available from our local produce store) and hardboiled eggs. It sounds weird to feed eggs to chickens, but the egg was the chick’s first food as it developed, and as long as its crushed they won’t associate a raw egg with food in the future. This is the easiest and cheapest supplement if you already have some laying hens. For the minerals we buy a commercial organic mineral mix and a seaweed meal. You can also start feeding the chicks leafy greens and grass, they might not eat much at first, but it gives them something different to peck at in their box. When the chicks are a few weeks old, we also start putting them outside in a small birdcage for a few hours to that they can experience being on the grass, then its not such a shock for them when they move into a chicken tractor. I’m not sure if this really necessary, but we usually “teach” the chicks to eat their food by tapping a finger in the food dish. This results in lots of chicks running over to your hand to see what you’re doing and a few will then try eating the food. After that, they are usually pretty quick to work out where the food is. The transition from the chicks living in the brooder box to moving into chicken tractors can be difficult to time, as it depends on your outside overnight temperatures. Ideally we hatch the chicks in spring or summer, so that they can move out after only 6 weeks, before they have all their feathers, because it is usually plenty warm enough by then. Otherwise they have to stay in their brooder box longer and once they reach that noisy messy stage I can't wait for them to move out! Even though it is warm enough, we find that when we put chicks out in the tractor for the first few nights they need to 'tucked in' at dusk because they are so used to living in a box and not having open sides, its quite scary for them. This means draping tarps, old sheets, towels and blankets over the tractor so that they feel like they're still in a solid box. Otherwise they spend the night trying to stick their little heads out of the mesh and sometimes they manage to squeeze out. We only have to do this for about a week until they get used to it. This also helps to keep the dew off their grass and keep out any draughts, while they acclimatise to not having the heat lamp above them at night. After the chicks move out of the brooder and into a chicken tractor they eat grass, grow the rest of their feathers and very quickly get bigger and bossier. Its hard to remember that they were once tiny fluff-balls, and all the hard work pays off when you count up how many new layers you will have next spring (and how many roast roosters you will have in the freezer in a few months). What do you think? Any tips for raising chicks? Chicken tractor ebook coming soon! 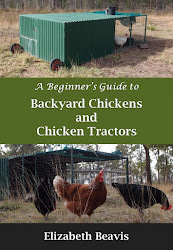 Follow Eight Acres - the blog's board Eight Acres - the blog: Chicken tractor ebook on Pinterest.